Something over a week ago I had the pleasure of making my way up to the little ski resort of La Thuile in the Val D’Aosta to learn about the latest results from the Venus Express mission. 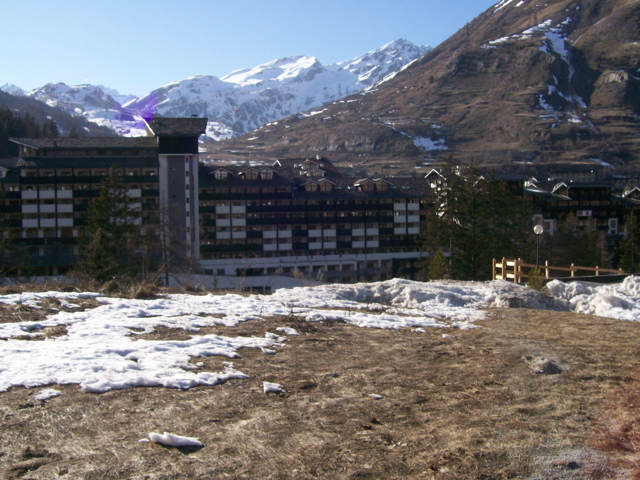 (You can imagine it was a tough decision to go to La Thuile and hear real scientists talking about Venus when I could have instead been listening to luminaries such as Mark Morano drone on at the Heartland Institute pseudoscience bash. ) My own connection with the Venus Express meeting came about through some work I’ve been doing on habitability of the newly discovered "Super Earth" extrasolar planets like Gliese 581c. Many of us think these may be "super-Venuses" rather than "Super-Earths," so it seemed like time to touch base with the people working on our own Venus. The fact that we can put together the same bits of physics we use to understand global warming on Earth in order to understand the interplay of the carbon dioxide greenhouse with sulfuric acid clouds on Venus is a testament to the fundamental power of climate science, and gives the lie to Claude Allègre’s oft stated claim that there is no such thing as a science of climate. Altogether, it was a thrilling meeting. The Venus Express mission was described in this earlier RealClimate article, and you can read more about the mission at the VEX home page. Venus Express was done on the cheap, mostly using instruments cobbled together from leftover hardware from Mars Express and the Rosetta comet mission. The results have been nonetheless spectacular, and La Thuile provided a suitably spectacular venue in which to discuss them. This meeting was one in the series of Rencontres de Moriond in which scientists get together for a week of intensive discussion of leading-edge topics in physics — plus equally intensive skiing, climbing, hiking and enjoyment of good Northern Italian cooking. If you’ve ever read any of Jeremy Bernstein’s accounts of how he got involved in mountaineering through his attendence at particle physics meetings conducted in similar circumstances, you’ll know the general idea about how such things work. It’s a great way to shake loose creative thinking. And it’s one of those things that makes real science so much fun. Perfectly aside from the setting, it was a thrill to see the vigor of this field, and the influx of talented new young postdocs and graduates students, with all their fresh ideas and enthusiasm. I hope to give just a bit of the flavor of what went on during that eventful week. Venus has an Earthlike mass and surface gravity, the latter being 8.9 meters per second per second, only slightly less than Earth’s. Venus is in a very nearly circular orbit about the Sun with orbital period (year) equal to 224.65 Earth days. Venus rotates much more slowly than Earth, however, and this has many consequences for the atmospheric dynamics, since it greatly reduces the Coriolis accelerations that do so much to organize Earth’s large scale atmospheric circulations. In fact, the rotation of the planet is retrograde — i.e. opposite in direction to the rotation of the orbit. The siderial day on Venus — the period with which the star patterns would repeat, if you could see the stars from the surface — is 243 Earth days, but since this is in the retrograde direction, it adds to the angular velocity of the planet relative to the Sun. Thus, the rate of rotation relative to the Sun is 1/224.65 + 1/243 rotations per Earth day, leading to a solar day of 1/(1/224.65 + 1/243), or 116.7 Earth days. This is the time between sunrises, as would be seen from the planet’s surface. Thus, Venus’ solar day is roughly half of its year, as illustrated in the sketch below (credit K. Fuller). You might think that the long day would result in the dayside heating to extreme temperatures while the darkness-plunged nightside plummeted to relatively frigid values. In fact, because of the dense 92 bar atmosphere, it takes a very long time for most of the atmosphere to heat up or cool down, and there is little day/night variation over most of the depth of the atmosphere. Higher up, however, there is a diurnal and seasonal cycle, as illustrated by the black vs. green lines in the accompanying sketch — Venus Express in fact found indications that the diurnal cycle extended deeper into the atmosphere than this traditional sketch suggests, with significant temperature variations penetrating to 45 km. altitude. The atmosphere of Venus is nearly pure carbon dioxide, with a few percent of nitrogen thrown in. It also contains traces of water vapor, which though tiny, contribute significantly to the greenhouse effect of the atmosphere.Most of the greenhouse effect comes from the carbon dioxide, however, which by itself is sufficient to raise the surface temperature most of the way toward its observed value of around 470C. A key feature of the atmosphere of Venus is the sulfuric acid cloud deck. These clouds account for the high reflectivity of Venus, but because they also reflect infrared back to the surface (unlike water clouds, which absorb and emit), they have a warming effect as well, and constitute the second most important factor in the greenhouse effect of Venus after carbon dioxide. Radiation model calculations demonstrate that the clouds have a pronounced net cooling effect on the planet, when both factors are taken into account. The cloud deck comes from combinations of sulfur dioxide with water, but the nature of the sulfur cycle allowing the cloud deck to be maintained is currently a matter of considerable uncertainty. For a full list of the complement of instruments on Venus Express you can take a look at the VEX Instrument Summary .For the most part, I’ll focus on data from VIRTIS and SPICAV-SOIR. VIRTIS is a spectral imager which observes patches of Venus in a set of wavelengths ranging from the ultraviolet (0.25 microns) to the near infrared (5 microns). On the night-side VIRTIS infrared yields thermal emission, which can provide information about cloud structure and temperature, as well as information about atmospheric constituents.. On the day-side VIRTIS infrared images are dominated by reflection of the near-infrared component of sunlight; the absorption of solar near-infrared also provides valuable information about atmospheric constituents, as well as information about cloud structure that is complementary to the night-side thermal emission. SPICAV/SOIR is a spectrometer with somewhat different characteristics; it returns high-resolution ultraviolet images , which reveal interesting aspects of atmospheric dynamics. The reflection of short wavelengths like ultraviolet gives a good indication of the occurrence of cloud particles, but the utility of ultraviolet observations is enhanced by the presence of an as-yet unidentified ultraviolet absorber in the atmosphere of Venus, which shows up in the form of dark streaks on ultraviolet images. Besides being useful as an ultraviolet imager, SPICAV/SOIR is used with a technique called occultation, in which the attenuation of starlight or sunlight passing through the atmosphere provides information about the vertical profile of various atmospheric constitutents, including sulfur dioxide, water vapor (and its various isotopes), carbon monoxide, carbonyl sulfide and oxygen. SPICAV is derived from spare parts from a similar instrument (SPICAM) that flew on Mars Express, but SOIR, which adds infrared channels useful for solar occultuation measurements, was newly developed for Venus Express. Venus Express also carried a thermal infrared spectrometer, PFS, which was intended to study wavelengths longer than 5 microns. Thermal emission in these wavelengths is important to the understanding of the radiation budget of Venus. Unfortunately, this instrument was the one disappointment in an otherwise spectacularly successful mission, as the PFS was rendered inoperative by the failure of a critical shutter to open. But no worries — the instruments that did work provide a great wealth of new material to think about. Venus Express sports a lightweight radio-science package, VeRa. Radio occultation is a low tech but highly valuable workhorse of planetary observation. By observing the refraction of radio waves passing through the atmosphere, one can obtain density profiles, since the index of refraction is proportional to density. From density and the hydrostatic relation (i.e. pressure is the weight of all the fluid above you) it is possible to reconstruct temperature profiles if you know what the atmosphere is made of. On Venus, radio occultation can observe the atmosphere down to about 45 km. altitude from the surface. 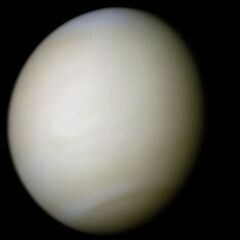 Venus is not the featureless cue-ball you’d think it is from low-resolution observations in the visible spectrum. 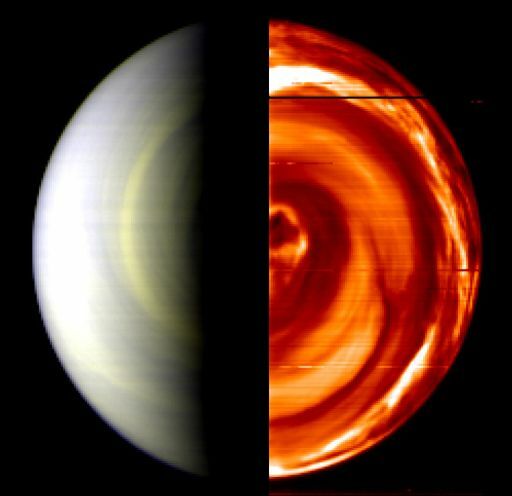 Observations of Venus in the infrared and ultraviolet spectrum show a variety of intriguing wave and vortex patterns. The highly dynamic nature of the upper atmosphere of Venus is not a new discovery, but the increasingly sophisticated observations have continued to enrich our understanding of Venus atmospheric dynamics. Indeed a new era of Venus meteorology is dawning. For multiple reasons, the deep atmosphere of Venus is a fairly quiescent place: the low rotation rate of Venus makes it easy for the dense atmosphere to transport heat and keep temperatures horizontally uniform, while the mass of the atmosphere and the limititation of infrared cooling by the dense carbon dioxide atmosphere even out the diurnal and seasonal cycle. Moreover, through a combination of reflection, scattering and absorption, only a trickle of sunlight reaches the surface to drive convection and other atmospheric circulations. Things can happen more rapidly in the upper part of the atmosphere, which can also support stronger temperature gradients. Keep in mind that the top 1% of the mass of the atmosphere of Venus is about like the whole atmosphere of Earth, and that there is plenty of dynamics and temperature variations at least down to the 2 bar level (about 45 km above the surface). There is plenty of active atmosphere to keep dynamicists happy. If you will, you can think of Venus as consisting of a dynamically active 2 bar "atmosphere" atop a sluggish deep "ocean." Now let’s take a look at some of the circulation patterns revealed by Venus Express . The patterns are made visible through the modulation of the cloud distributions, and for the most part reflect motions taking place at altitudes of 45-60 km. In the night-side infrared, clouds show up as dark patches or streaks, since they block upwelling infrared; relatively cloud-free areas are bright. The image at the right shows the night-side VIRTIS infrared image, taken looking toward the South Pole, on the right half of the image. The left half is a day-side observation in the visible spectrum, from reflected sunlight. You can see a concentrated vortex structure near the pole, and an intriguing spiral cloud pattern, probably due to the differential rotation of the atmosphere — i.e. the fact that it is swirling like a bathtub vortex and not in rigid-body rotation. It is generally believed that there is subsiding motion near the pole, but the extent of vertical motions associated with these cloud patterns is not well known. Some of the patterns are interpreted as variations in cloud top height (hence temperature) induced by the vertical motion field, rather than as variations in cloud thickness. Many of the eddies give an appearance very much like two-dimensional vortices having little vertical motion, while other cloud and wave patterns look more like Earth’s boundary layer convective cloud streets (modulated by wind shear), or like gravity waves. The South Polar vortex shows a dipole pattern very much like has been seen earlier at the North Pole. Here’s an example of the evolution, viewed by VIRTIS in an infrared channel thought to be mostly responding to cloud top height (see South-polar features on Venus similar to those near the north pole by G. Piccioni et al. Nature,29 November 2007.) The vortex you are seeing is about 2000 km. across. And this color image of the vortex, taken in the 5 micron band, shows the dipole structure more clearly. The bright yellow region is the dayside. Although the surface of Venus rotates only slowly, the upper atmosphere has taken on a rotation rate of its own, and air around the 50km level circles the planet with a period of roughly 5 days. This is called super-rotation, because the rotation is in the same sense as the rotation of the planet, but stronger. It allows the upper atmosphere to support substantial temperature gradients, by providing a Coriolis acceleration which can offset pressure gradients associated with temperature variations. The super-rotation is not actually a rigid-body rotation, but has a very distinctive profile in latitude. 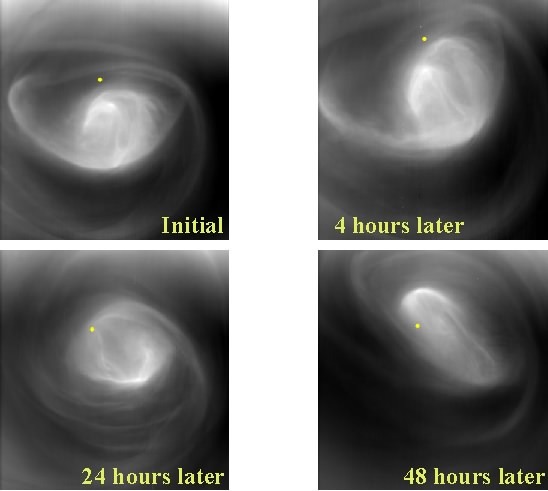 Venus Express has provided new observations of the zonal wind pattern using cloud-tracking methods, an example of which is shown to the right. Note particularly the uniform velocity in the nightside winds, extending from 70S to the Equator; the polar regions are in something closer to rigid body rotation. What accounts for this pattern? In all theories, the transport of momentum by transient eddies is critical to redistributing the angular momentum and creating low-latitude super-rotation. Thus, the improved understanding of eddy dynamics from Venus Express will help us to determine the character of the eddies and their transports. An essential question remains to be answered: What are these eddies and where to they come from? Much prevailing thinking ascribes the eddies to instabilities of horizontally sheared jets — the barotropic instability — but the images themselves do not give a very clear impression of jet instability. In a related notable result, the modelling team from the Laboratoire de Meteorologie Dynamique, Paris has achieved a very convincing simulation of super-rotation in a new Venus general circulation model. Though the deep atmosphere of Venus is sluggish, its dynamics is nonetheless crucial since it is this circulation which brings angular momentum from the surface to the upper atmosphere; this circulation is also critical for atmospheric chemistry, since it transports gases to the surface where they can react to form minerals, and (more speculatively) transports volcanic outgassing to the cloud deck. Higher in the atmosphere, the extreme temperature difference between the dayside and the nightside, due to solar absorption in the atmosphere on the dayside, drives a circulation flowing from the hot dayside to the cold nightside . This circulation also gives rise to another fascinating phenomenon, the oxygen airglow. On the dayside, extreme ultraviolet from the Sun can actually break up carbon dioxide molecules into their component parts, which liberates free oxygen atoms. These are carried to the cold nightside, where they recombine into O2, releasing energy in the 1.27 micron infrared range. Venus express carried out many new observations of the airglow phenomenon and the circulation in these extreme upper reaches of the atmosphere — which also bear on the processes allowing planetary atmospheres to escape to space. Using occultation methods, Venus Express has shed far more light on atmospheric chemistry than I can begin to go into here, but I will at least mention a few of the results. Quite remarkably, the remote-sensing techniques can detect not only the profiles of water vapor in the atmosphere, but also the various isotopes, notably the heavier version — deuterated water, HDO, in which deuterium substitutes for one of the hydrogens. In the Earth’s upper atmosphere, the HDO to H2O ratio is depleted relative to the water vapor in the lower atmosphere, because the heavier HDO condenses out more readily when it rains. On Venus, the situation is the opposite, and HDO is greatly enriched relative to lower level water vapor. This occurs because water vapor is broken apart by sunlight, and the lighter hydrogen escapes more readily than the heavier deuterium. Venus Express also found, though, that oxygen is escaping from the atmosphere in the ratio expected from breakup of water, suggesting that non-thermal escape processes in which chemical reactions give an extra kick to atoms, are important. Putting together a consistent picture which simultaneously accounts for the oxygen escape and the deuterium enrichment will tell us much about the mechanisms by which planets lose atmospheres, and perhaps shed light on issues affecting habitability of extrasolar planets. Because the sulfuric acid cloud deck has such a profound impact on the climate of Venus, the chemistry of the Venusian sulfur cycle is of great interest. What is the lifetime of the clouds, absent resupply? Venus Express measurements, and associated laboratory experiments, are helping to clarify these issues as well. Carbonyl Sulfide has been observed in the atmosphere, and there are good indications that the formation of polysulfur (S2, S4, etc.) and possible subsequent precipitation plays a role in the sulfur cycle. The nature of sulfur dioxide resupply connects up with the contentious issue of catastrophic resurfacing of Venus, which I’ll take up shortly. With such a thick CO2 atmosphere, you’d think it would be utterly impossible to see the surface of Venus in the infrared. The issue of "saturation" of the absorption of infrared by CO2 has been discussed previously on RealClimate, but it turns out that even with 92 bars of CO2 in the atmosphere, Venus is not saturated throughout the infrared spectrum. There is a narrow window region in the vicinity of 1 micron wavelength, which allows the surface to be observed in the infrared. 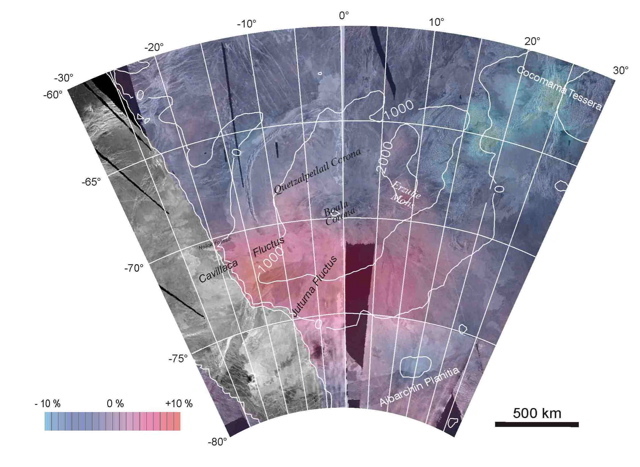 Venus Express has exploited this window to make maps of infrared emission from the surface, which, combined with topography data from the Magellan radar altimiter, allow an estimate of surface emissivity. Hopefully, this will shed some light on the minerology of the surface, which is largely mysterious. Just as a sample of the new data, here is an image showing the surface brightness anomaly overlain with radar topography. This image comes courtesy of Joern Helbert and his student Nils Müller, and of course as for all results derived from VIRTIS, the VIRTIS P.I’s Giuseppe Piccioni and Pierre Drossart deserve a round of applause as well. One of the most exciting questions concerning the nature of Venus is whether the planet has undergone catastrophic resurfacing in the relatively recent past.. Venus has no plate tectonics to gradually engulf part of the surface. Unlike Earth or Mars, impact craters are uniformly distributed over the surface. By some reckonings, there appear to be no old craters, as witnessed by the apparent lack of craters in a state of partial degradation. This would argue for the entire surface having been engulfed or flooded over with magma some time in the past half billion years or so. However, the morphology of the surface lends itself to varying interpretations, and these were the subject of a genteel debate between David Grinspoon (for resurfacing) and Sue Smrekar (in the opposing camp). I can’t say that anybody struck a knockout blow, but it was certainly informative, and serves as another example of the way real scientists try to hash out uncertainties and conflicting theories. There is no herd mentality here, any more than there is in studies of Earth’s climate. It’s in the DNA of scientists to poke at theories all the time, and never cease their questioning. “Consensus” does not consist in agreeing on everything, but rather in agreeing on a common set of tools and methodologies, as well as on a set of results that can be considered settled to a sufficient degree that further results can be confidently built upon them. Consensus of this sort exists for Venus as well as for Earth, and nobody makes a fuss about it. The question of resurfacing has major implications for the climate history of Venus. No active volcano has yet been observed on Venus, and it has been conjectured by David Grinspoon that perhaps Venus goes through cycles of extreme volcanism and sulfur resupply to the cloud-deck, followed by long quiescent periods in which the clouds dissipate and leave the planet’s surface much hotter than its already torrid temperature. This is indeed a frontier area of planetary science, and one which engages phenomena extending from the interior to mineral reactions at the planet’s surface, and onward to photochemistry in the outer reaches of the amosphere. Modern planetary probes are so versatile they can be re-programmed to do things their original designers never anticipated. With colleagues at the University of Chicago, I’m doing that now, using a minerology probe on the Spirit and Opportunity rovers on Mars to examine atmospheric argon. Taking a leaf from the Pale Blue Dot observations of Earth from Galileo, popularized by Carl Sagan (look. here. for a detailed report of those observations), Venus Express mission scientists have gotten the bright idea of using observations of Earth from Venus to test methods for searching for habitable extrasolar planets. The next generation of extrasolar planet-finders will return spectra of the planets averaged over the entire planetary disk, so learning how to make the most of "single pixel astronomy" is of the utmost importance. Already, observation of the Earth spectrum by VIRTIS has detected Earth’s CO2, oxygen and water vapor. Observations by SPICAV show the absorption feature characteristic of ozone. Work is underway, spearheaded by Darren Williams, to see if Earth’s oceans can be detected through the characteristic sun glint they produce. At the meeting I also had the pleasure of meeting Enric Pallé, a young astronomer who is probably best known to regular RealClimate readers for his attempts to estimate trends in Earth’s albedo through ground-based measurements of lunar Earthshine. . Enric’s connection with the Earth from Venus session comes about because he has been looking at ways to measure a planet’s length of day by examining fluctuations in reflected sunlight; he has also been trying to detect Earth’s vegetative "red edge" through Earthshine observations. Enric tells me that he has refined his somewhat controversial Earth albedo estimates, and these no longer show the mysterious and striking long-term albedo trends reported in the original paper. To tell the whole story, though, I should note that the satellite based CERES albedo estimates (which showed an opposite trend to Earthshine) have evidently also been revised, owing to discovery of a drift due to deterioration in a filter. We’ll have to wait for Enric’s paper to see the details, but estimates of albedo fluctuations appear to be converging, according to preliminary results he showed me. This is science at its best, and a reminder both that detecting trends from satellites is difficult, and that one should avoid building elaborate and earthshaking interpretations on data from novel observing techniques like Earthshine until they have time to mature. We all could have been spared a lot of grief if the Alabama boys who pushed their erroneous microwave satellite temperature trends over surface records for so long had been as diligent as Enric in re-examining their methods. All in all, quite a week! And despite the lack of good snow on the cross-country trails, I did manage to get in a few nice excursions up the valley, with the help of a prodigious supply of red klister. I am looking forward to seeing what another year of Venus Express observations brings. Yea…I would have definitely chosen the Heartland meeting. No brainer. This was fascinating though, and I was suprised to learn that there is still water vapor there. I was curious as to what kind of climate implications there might have been (or that extended to the present day) from the global resurfacing of the planet? Is it possible, now, to get a more accurate idea of relative contribution, to greenhouse effect, of atmospheric venusian constituants? Is an important contribution of H2O, HDO,… , confirmed? at Paris Observatory in 1998, leading to the first observation in 2001. Published in Astronomy and Astrophyics. 392, 231, 2002. Actually, V. Arcichovsky had the same idea in 1912. But at that time the photographic plates were not sensitive enough in the infrared. Fascinating contribution, Ray. Just one query. I was under the impression that “no worries” was a uniquely Australian expression. You wrote about the disagreement between David Grinspoon and Sue Smrekar. Fine, but then you sidestepped into trying to convince your readers that they in fact were in some kind of consensus. About what exactly was the consensus about, if the disagreement was real? Is this article an attempt to demonstrate that what applies on earth also applies on Venus and hence climate science has got AGW right? 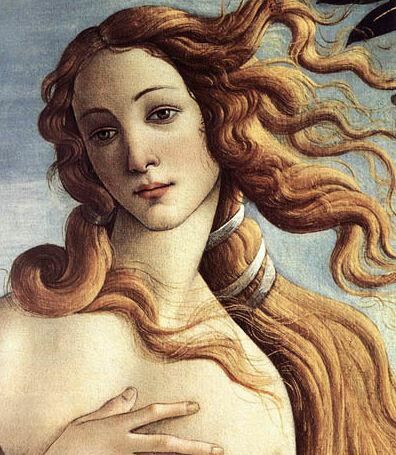 Venus is so cool!!!!! Metaphorically speaking, that is. I still haven’t succeeded in modeling its atmosphere adequately, but I’m going to keep trying. But there’s plenty still to be learned about Venus, and there probably always will be, at least until the sun engulfs it several billion years from now. Raypierre, Thank you, thank you, thank you. This was a great summary and obviously a lot of work. Those of us who have day jobs that only let us follow such developments as spectators rely on this type of trip report to keep us up to date. Speaking of “day jobs,” I’d be interested in the degradation of the filter–was it perchance due to radiation darkening? Do you know who I could contact to get more info? Again, thanks for providing this summary, and I hope that the laymen who read it will note the flavor of how science is really done that shines through the reporting. Very well done! Thank you. Thank You for the report. Not quite as good as being there, I’m sure, but I feel like I got a real sense of the excitement and the interrelatedness of all this science we have studied and find uses for. Of course, the slow rotation may have made life very difficult, so I image if there were some life, it would not have evolved much. Raypierre, thanks for presenting this interesting science. Let me test my understanding: the small amount of water vapor on Venus has relatively more effect than on Earth because its infrared spectrum is expanded due to the great pressure of the atmosphere? A key feature of the atmosphere of Venus is the sulfuric acid cloud deck. These clouds account for the high reflectivity of Venus, but because they also reflect infrared back to the surface (unlike water clouds, which absorb and emit), they have a warming effect as well, and constitute the second most important factor in the greenhouse effect of Venus after carbon dioxide. Radiation model calculations demonstrate that the clouds have a pronounced net cooling effect on the planet, when both factors are taken into account. I take it that sulfuric acid, unlike sulfur dioxide, is not a greenhouse gas, so it acts like a reflector. Then how can the clouds be a factor in the greenhouse effect? And when you talk about the clouds having a net cooling effect, is the other “factor” the reflection of incoming sunlight? Ray, does collision-induced absorption matter much on Venus, like the H2-N2 and N2-N2 collisional continuum that happens on Titan? I would think it is signifiant, being some 90 bars, but I never here much about that on Venus…just the CO2 and sulfuric acid. Physics is physics, and you can drop a banana on either planet and it will fall…but no, I don’t think that is what Dr. Pierrehumbert had in mind. More like to share some interesting new science/discoveries that others would enjoy. But comparative planetology has its role too; if you insist that there is nothing to astrophysics and climatology aside from pushing AGW, then I would suggest that the lessons from Venus assist in the predictive and explanatory power of a CO2-enriched atmosphere, and what might happen as we continue to add CO2 on Earth (not a runaway, but warming). If anyone thinks that runaway global warming is not a real threat to Earth then they are unaware that many feedback mechanisms are at play to set Earth on a logarithmic warming trend, quite similar to the effect seen on Venus. Don’t tell Heartland– they’ll just stage the next one in Davos. Although positive feedbacks certainly exist in the climate system (e.g. the responses from water vapor, ice-albedo) the “runaway” scenario is one I would not worry about for some billions of years when the sun goes into a red giant phase, ends up engulfing Mercury, etc. Something that might happen first is if plate tectonics stops from lack of mantle convection and CO2 is no longer able to be sufficiently outgassed and we end up in another snowball state. From the lower curve, you can see that a high CO2, and saturated atmosphere is very sensitive and T^4 no longer applies. 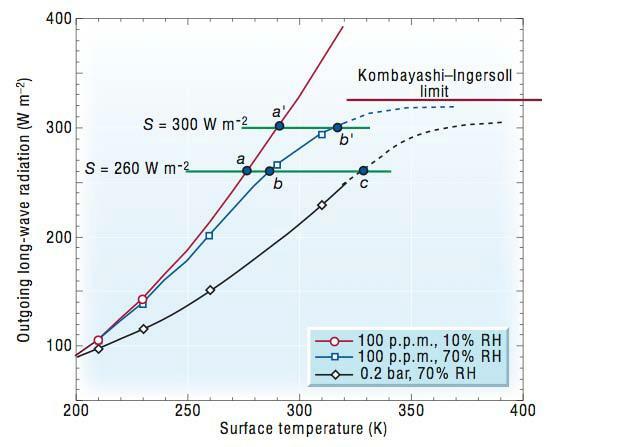 If the Kombayashi-Ingersoll limit is exceeded by incoming solar radiation then eventually the oceans will evaporate and the water will separate into its hydrogen and oxygen parts and escape the atmosphere, and with no more oceans you lose your big carbon sinks. The Earth and Venus have roughly the same amount of CO2, but on Earth it is all locked up in rocks and in the oceans and biosphere, with just enough in the atmosphere to make it livable. Can you get that on Earth? As it turns out, the incoming solar radiation would need to be much higher, with much, much more CO2 (and saturated with water vapor) for this to happen in the here and now. This was really intersting, Thank you! I’m curious – could there be some similarity between Venusian superotation and Earth’s QBO (the later having a phase that could be considered superotation, occuring near the equator where the coriolis effect is weaker, and being driven by wind-shear dependent damping of vertically propogating Rossby-gravity and Kelvin waves)? It might help to understand the relative importance of different gasses by (visually) comparing emission spectra of Venus and Earth. (I know pressure and composition of the whole gas mixture affect gas spectra, and also, temperature, both by doppler broadenning and by shifting the relative importance of different wavelengths.) Could differences in vertical variation of mixing ratio be important? – water vapor in Earth’s atmosphere declines ‘precipitously’ with height, afterall :); it would be an interesting to compare concentrations at the levels of significant radiation to space (at the relavent wavelengths). It might also be interesting to graph the temperature profile of the two planets’ atmospheres using pressure as the vertical coordinate. How high up are the 1 and 2 bar levels on Venus? 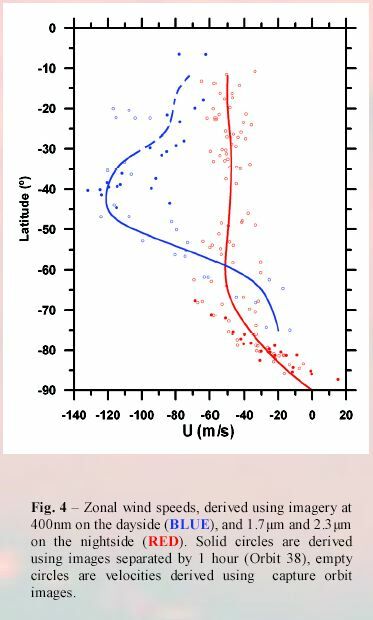 Where is the Venusian Tropopause (in pressure; I can see it’s around 90 km from the graph)? At the risk of packing too much into one comment, someone once tried to argue to me, with regards to volcanic outgassing of CO2 as a way to end a snowball state, that the CO2 dissociates in the upper atmosphere; I pointed out that C is too heavy to escape much (I vaguely recall coming up with a rough guesstimate of some trillions of years for thermal escape to draw down CO2 concentration by 1 ppm), and so would just diffuse downward to where greater pressure favors synthesis reactions (well maybe I didn’t go into the diffusion part but oh well…). Reading about the O escape from Venus got me to rethinking that. But even with chemical energy liberation, and also magnetic fields accelerating ions (for Earth, not Venus), my understanding is that O escape (and so I would expect C escape) from Earth is negligible compared to H escape. 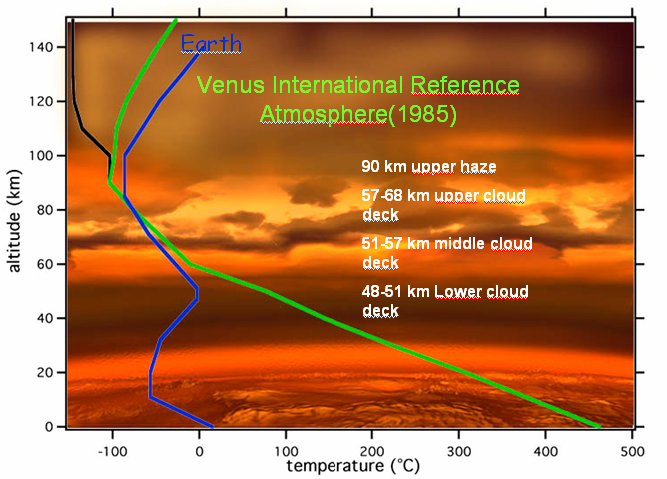 Is the daytime upper thermosphere on Venus much hotter than Earth’s (being closer to the sun and above the clouds)? Ray, do you see any prospect of terraforming Venus? Has anyone done the math for a sunshade between Venus and Sol, for example? It’d be foolish to lose any chance of prospecting for any traces of past life there, if there’s hope of finding such; would resurfacing, if it did happen, have occurred after the planet overheated from whatever friendlier conditions it may have had? I miss the swamps of Venus from the old stories. 18 re I suspect they didn’t want the frog to upstage the Rush Limbaugh impersonator who warmed up the crowd at the opening event. I’ll send along the fossil hydrogen screed- the basic idea is that since the volatile hydrocarbon fraction in coal varies by a factor of ~8 from deposit to deposit, and carbon content for the same energy density varies by ~ 30 %, the CO2 emissions of existing plants could be significantly mitigated by policies favoring mines with higher hydrogen contents. Re the response to #22: an entire LPSC session is being devoted to two meteorites from an as-yet undetermined, “differentiated planetary body,” which I guess is likely to be Venus or Mercury. Any discussion of this at the conference? The record of past conditions on Venus may have survived in the form of meteorites here on Earth or on the Moon. Grinspoon once had a theory that microbial life might survive in the venusian cloud deck and could be the source of mysterious large particles identified by the Pioneer probes. Sounds like this idea didn’t come up though. Excellent article. Thanks for the report and all the comment replies. I learned a lot on the first read and will do a second. I’m surprised that no one has asked this but how much does the increased levels of CO2 contribute to Venus’ global warming? The temperature is 455C greater than Earth yet the CO2 is only about 15 doublings that of Earth. What is the climate sensitivity on Venus to a doubling of CO2? 30C per doubling? Why are the basic figures so far off that of the sensitivity figures on Earth? there are obviously other things going on between the planets. If you removed the greenhouse effect on both Venus and Earth, Venus would actually be colder (even being closer to the sun) because of its thick cloud cover that allows only ~17 W/m2 of solar radiation to get to the surface on average. You also need to figure in pressure broadening which makes the greenhouse gases more effective because it spreads the absorption over a broader range of wavelengths/frequencies. If you shift one planet over in the other direction you have Mars which is pure CO2 but only ~ 7-10 millibars of total atmospheric pressure, and CO2 is relatively short-lived there because it condenses out because it is so cold. You also have no oceans. On Earth, the thermal capacity of the oceans is very, very large. In fact, if you heated the world’s oceans by just 0.1 C and then took all that heat you did that with and threw it in the atmosphere, the atmosphere would warm by some 100 degrees C. If we had no oceans, then we’d be a bit more sensitive to external perturbations– Venus’ thick atmosphere makes up for some of that. I also don’t know, but looking from Ray’s lapse rate figure, I would imagine the greenhouse effect is stronger on that basis (stronger lapse rate= stronger greenhouse effect). Once you get outside a certain CO2 range (not really one relevant to us today), but you will start to lose the logarithmic range. I would imagine Venus follows a different relationship, but I highly doubt it resembles forcing = 5.35 ln(Cf/Ci), also in part because the primary CO2 absorption is not at 667 cm-1 but at something like 2500 cm-1. A lot of what I said is speculation, but it is at least quite obvious it would not be so easy get a climate sensitivity from Venus and apply it to Earth. John, I imagine being ~40 million km nearer the sun has an effect on the baseline temperature, so it would be less than 30C per doubling. Nice summary of very interesting work on a very interesting planet; thanks! Raypierre, I tried to post this yesterday but it didn’t get through for some reason. Regarding absorption/scattering by cloud particles, in the Fraunhofer regime droplets scatter twice as much light as they intercept (in the Mie regime it can be as much as 4x), so even for complete absorption the absorption/scattering ratio is ~1. Re response to 21 – Thank you. Yes, Venus was a nicer place with tropical rain forests. How much water would be needed? It would be a catalyst, right? But, wouldn’t it disappear into the rock as crystal water — at room temperature, unlike at present temperatures? I don’t know if it really requires a response…but I thought I’d bring it to your attention. When would the atmosphere on Venus have been more conducive to life. How many millions of years back? And what triggering the runaway warming? Ref 34 from Bill Bua. May I suggest that both references are correct, and are different interpretations of the same data. It is true that in the latter part of the 20th century world temperatures rose significantly, and temperatures are still higher than they were 30 years ago. It is also true that in recent years, this rise seems to have at least stopped. World temperatures, I would suggest, have either gone through a shallow maximum, and are now declining, or are going through a point of inflexion. Looking at the GISTEMP data for January and February 2008, it is arguable that all five sets of world temperature anomalies are in agreement with this interpretation. Such a point of inflexion was forecast by Smith et al in Science, August 10 2007, pp 796 to 799, with their Decadal Model. However, I would point out that their forecast for 2008 is 0.4 C, and the average for January and February 2008 is 0.13 C, according to the HAD/CRU data set. Which interpretation of what is happening to world temperatures is correct, is not, IMHO, clear; it may be what anyone likes to believe. I would suggest that we need quite a few more months of data to know whether we have have seen a maximum, or are seeing a point of inflexion. Lynn V #35: billions rather than millions of years. And it’s even possible that it never happened, i.e., that Venus has always been, well, uncomfortably warm. The mechanism would be, from what I’ve read, first reaching temperatures where large parts of the ocean go up in vapour, and the water vapour feedback exceeds 100% until the ocean is gone. After that, with rock weathering gone, CO2 would build up due to volcanism, gradually driving the CO2 out of the carbonate crustal and mantle rock into the atmosphere. It has been proposed to inject SO2 or H2S into the stratosphere as a “last resort” to directly counter global warming. I believe the idea is that these chemicals will react in the atmosphere to produce sulphuric acid droplets to scatter sunlight back into space. But you argue that larger droplets are better at back scattering. Is that true, weight for weight, since if you double the size of droplets, you can only have an eighth the number for a given weight? Is there any way one could increase the size of particles, if that produced a higher albedo for given weight? Has there ever been an experiment in which we have replicated the atmosphere of Venus in say a greenhouse, and then watched its temperature rise to at least half of that on Venus 400 degrees say? It seems that would be a perfect and easily done experiment tp prove our assumptions. Does anyone have a link to a study showing such a study? I was told several were attempted but no dramatic increase observed. Fascinating stuff. Now about the earth’s runaway greenhouse. I had been under the impression that only another .5-1 billion years of solar evolution (3-6% brightening) would set it off. I get the impression that some here might think that is way too early. Perhaps the shorter time period is for enough warming to be catastrophic for life as we know it, but not yet the true runaway greenhouse? The terraforming of Venus is science fiction, but if a sun shade was put at Sun-Venus lagrange point to freeze out the CO2 at the poles, you would be left with an N2 atmosphere. Getting water to the planet to make those shallow seas of SF would require a hell of a lot of ice, but the energy could be less than you’d think if you play a clever game of billiards, using the outer planets gravity to smack little comets into larger kuiper belt objects, thus changing their orbits to get that slingshot planetary flyby to Venus. According to James Lovelock by 2100 most of the equatorial regions of the earth will resemble ‘mars’ not venus? As an observer..I am seeing many many environmental effects around the world relating to ‘climate change’ but not necessarily ‘greenhouse effect’. The climate is definately more variable and extreme that in decades past..case in point..the world is getting divided between those countries suffering from drought and those suffering from frequent flooding. I’m not sure referring to venus when arguing about greenhouse conditions is that appropriate..coz that is venus’s stable state, it has never had a fragile and complex atmosphere like ours. A pathogenic condition is noticable only when it deviates from the mean, in venus’s case a dense swirling gas blanket is the mean and probaly has been for a billion years or more. Been reading more on Lovelock, and his pedigree as a scientist is unquestionable.. a real scientist’s scientist!..the only critisim that keeps popping up is his underestimation of CFCs as a pathogenic gas for humans..it isn’t, but it sure as hell was for mother earth! The one thing that is very apparent to him is that we are now well into a positive feedback world and with the world still obsessed with boosting economies and a population likely to peak at 9bil (if we get there?? ), there is little chance of reversing the +ve path we’re on. In anyone’s opinion..what are the 3 most important things the world has to do collectively..NOW.. to cut the 30bil tonnes of CO2/yr not just by 1/2..not by 3/4 but totally elimiante it. This forum is not about politics although scientific/political/social solutions are the only way I can see us capturing this genie. When might we expect thirsty (they need our water!) Venusian climate scientists, plus guns natch, to arrive here and disprove for ever the theory of AGW? We talk of climate sensitivity and we gauge that 550 ppmv of CO2e probably means 3C of mean global temperature rise but what about systems response to that rise ? The Arctic sea ice, Greenland and West Antarctic Ice sheets and global glaciers are all responding to warming so surely the problem for humanity is not climate sensitivity per se but the response of earths systems to that warming. The intertia presumed/assumed in these large scale ice based systems is not as great as forecast and hence we are see possible rapid non linear responses to 0.8C of warming with 0.6C in the pipeline and another 0.5C (James Hansens words) from the current fossil fuel infrastructure making 1.9C in total almost to be guaranteed. if system response to 0.8C is troubling and ahead of RC/IPCC projections then what happens when it is a whole degree warmer please? Re #41, Reading Lovelock is alarming but I prefer Hansen as he is even more empirical in his judgements and his evidence seens good but his projections sincere and grave. Re #40 Andrew Worth: Getting the CO2 to freeze out on the poles would be a bit of a problem as most of it would first become liquid, forming a CO2 ocean. One possible technique would be to arrest Venus’ rotation, which is very slow already, to make it always face the same side to the sun. Doable with a suitably designed impact, requiring “little” (by terraforming standards) energy. Then, the permanently dark side could become a “CO2 graveyard” under a kilometres thick near-hemispherical CO2 ice sheet, while the sunny side could enjoy Earth-like climate. Even with a range of climate zones… wonder how thick the atmosphere could be while preserving the needed temperature gradient. No free water vapour though, that’s for sure. A bit of a limitation. If an atmosphere exerting a pressure of a tonne per square centimeter is frozen into a pair of polar hockey pucks > 100 kilometers high, the crust is not going to like it. Squashed into the Venereal mantle by a kilobar of dry ice, the oppressed polar crust will sink and crinkle into a bull’s eye horst and graben, looking for all the world like …Egads has this guy explained the Martian polar terrane ?? A lunar expedition discovers remains of an earlier space expedition…way too much earlier (gulp) to be from Earth. There are writings, and as top linguists back on earth try to decipher them, people panic. What if the spacelings made it to Earth and are among us? Linguists find out they were from Venus over a billion years ago. The Venus science then gets corrected and cleared up (from the Venusians’ advanced scientific and natural history writings that are slowly deciphered). It was the Venusians who had triggered the runaway warming, millions of years earlier than would have happened naturally. They knew they were in a fragile climate balance, but had dithered and gone on with their proligate party life. In their venus-engineering-gone-wrong they had even slowed down the rotation of Venus. But a small colony of Venusians were able to escape, planning to settle on earth. Then their spaceship had problems, and they were forced to land on the moon, where they perished, despite their desperate attempts to venus-form it. Or did they all perish? There was a space pod mentioned in their chronicles, and their hope that perhaps some would make it to earth. But no trace of the pod can be found…. I like the idea of using the Kuiper belt ice to arrest the planets rotation, would 50 million cubic kilometres coming in at 70 km/sec (guesstimate) relative to the planet be enough to do that? Freezing it all out over a smaller area at one point rather than two makes more sense, but surely we can keep the area of this dry icecap down to less than 60 million square kilometres? Gusbob, Great idea. Now all we need is a greenhouse with a 100 km tall roof. Maybe there’s one on Venus.